The holiday season is upon us, and now it’s time to start thinking about holiday lighting. If you enjoy Christmas light displays and plan to put them up at your home, there are many ways you can create a light show that will make your house the envy of your neighborhood this year. Driving around to look at Christmas lights is a yearly tradition for many families. Finding the best displays is a holiday scavenger hunt. The best Christmas light displays often employ several different lighting methods to make their scene grand. Here are some of the ways you can make your Christmas light display one of the best. The options are truly endless, but some of the best holiday light displays include characters, animals, trains, or other designs that were created with a combination of wood or metal, and Christmas lights. Whether you want to create a train, some reindeer, a sleigh, or anything else, having a creative design display will make your house stand out from others. Growing in popularity over the last several years, putting up Christmas themed inflatables are a great way to add lights, color, and fun to your yard. If you have typically only used string lights, led rope lights can also be fun. Whether you want to twist them around trees or porch railings, rope lights are colorful and easy to use. You can also use rope lights to create rope light chandeliers both inside and outside. If you really want to make a big splash in your neighborhood, setting up a lighting display that is synchronized with music will do the trick. If you ‘re going to set up a dancing holiday lights display, it will take some pre-planning to get the show ready. The result will be a mesmerizing display that will draw the attention of Christmas tree light lovers from all around your area. If you have a sidewalk, pathway, or driveway, you can create unique designs along with your walkways that will add another level of Christmas cheer to your display. Whether you want to use candy canes, different colored lights, rope lights, or something else, your walkway is a great place to add lights. 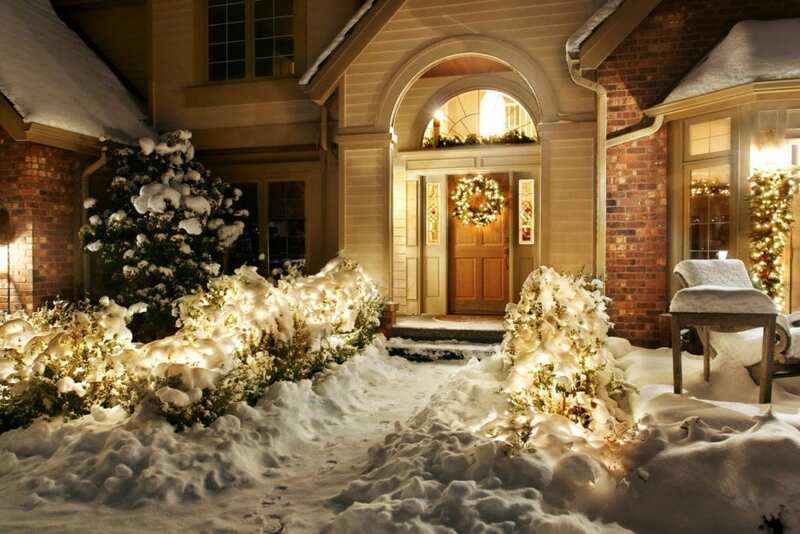 Having walkway lights will not only enhance your holiday lighting design but will also provide extra light along your path. Instead of just circling your trees with string or rope lights, you can purchase bush lights that come in a net-like form, and attach those to your trees for lots of little lights to illuminate your yard and add to your Christmas light display. When people see houses with excellent holiday light displays, they often get out to take pictures in front of the presentations. Make your yard fun and unique from others by adding an archway that lights up with different colored lights, for people to walk through. Attach icicle lights around a hula hoop and then hang from your porch or your trees for an added fun design that other people won’t have. Use this DIY method to create Christmas balls that can range from small to large. The holiday light balls can be placed all over your yard to create a playful look without a lot of effort. Now that Christmas is almost here, if you want to create a yard with holiday lighting that will be the envy of your neighborhood, and sought out by Christmas light sightseers, it’s time to start planning. Looking at Christmas lights with family is a great way to spend family time together, doing something that is fun for all ages. Planning and executing an impressive Christmas light display is another way family members can spend quality time together. Whether you have a simple or complex holiday lighting display, people will appreciate your efforts.